Ships from and sold by Wordery Canada. In this sweeping and synthesizing work Professor Omeljan Pritsak charts the influence of Western European, Arabic, Khazaro-Bulgarian, and, later, Byzantine metrological and numismatic systems on the development of these systems in Kyivan Rus'. 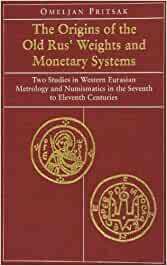 Beginning with a survey of the weights and monetary systems extant in Eurasia in the 7th to 11th centuries, Pritsak goes on to solve many of the fundamental problems that have existed for over a century in the study of Old Rus' metrology and numismatics. Many of Pritsak's conclusions challenge conventional theories in this field. Students of the history of Rus' and numismatists in general will find this to be the most thoroughly researched and documented English-language study of the subject to date. As the title indicates, this book explores two distinct but related topics: the various monetary-weight systems that developed in European Russia during the Viking Age and the Rus' coinage of the Kievan era...These two essays constitute an important contribution to our knowledge of Rus' metrology and numismatics. While particular interpretations can be disputed, Pritsak's essays are marked by extraordinary erudition, a number of inspired insights, a western Eurasian view that transcends the narrow confines of the Rus' lands, and the collection in one place of invaluable metrological data on diverse monetary-weight systems. Although we may not always agree with Pritsak, we are indebted to him for these essays which, hopefully, may stimulate further research on the monetary systems of European Russia in the Viking Age. Facts, figures and fonts abound, but do not be put off. For dedicated historians and numismatists it is well worth the effort. Omeljan Pritsak is Mykhailo Hryshevs'kyi Professor of Ukrainian History, Emeritus, at Harvard University. I have not read this book cover to cover but have perused it as I was interested in a specific area it covered but thus far I find every section to be well researched and very thought provoking. A difficult topic to cover; fascinating!